Investigator Vissarion Lom is summoned to Mirgorod, capital of the Vlast, to help investigate a series of terrorist attacks in the city. Josef Kantor, the son of a famous revolutionary, is the chief suspect and Lom is soon on his trail. But a simple manhunt turns into something more serious. An angel has fallen to the earth in the vast forest thousands of miles to the east. A devastating war between the Vlast and a grouping of island-nations to the west is coming to an end. And a spirit of the forest made manifest arrives in the city, seeking a young woman who may hold the key to the world's salvation. 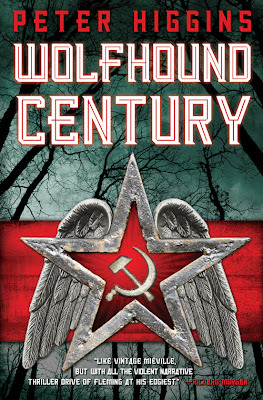 Wolfhound Century has picked up a fair bit of advance buzz as a novel to watch for this year. It's easy to see why. Coming over as the result of a genetic experiment splicing the works of Chine Mieville, Ian Fleming and Robert Holdstock into a single entity, but with a few twists of the author's own invention, it's definitely a refreshing change from Generic Epic Fantasy #312. The book is set in a world where revolvers and airplanes exist alongside nature spirits and giants, a sort-of Soviet Russia that never was but where honest cops still have to get on with foiling crimes, even crimes involving alien space entities and objects of transdimensional quantum power. It's a glorious mash-up of genres and styles that works very well. Higgins is telling a big story here, but by tightly restricting the points of view to just a few characters and by using short, sharp chapters he is able to get through the story with an enviable economy. Even better, that economy does not prevent the prose from being more ambitious than the SFF norm, with evocative flourishes and place and character undertaken in just a few deft sentences. The writing is superb and the characterisation excellent, with Lom and his nemesis Kantor both shown to be complex, damaged characters, and also both more than they initially appear. Even more impressive is the melding together of different ideas and genres. There are SF ideas about quantum physics and alternate realities existing alongside rural fantasy notions of nature spirits and living woodlands. In the middle of this lies the alternate-Soviet tropes of secret police and investigations where the truth is subservient to perception and politics. It could be an unruly mess, but Higgins makes it work with aplomb. Where the book not so much stumbles but falls flat on its face is the unexpectedly abrupt ending. 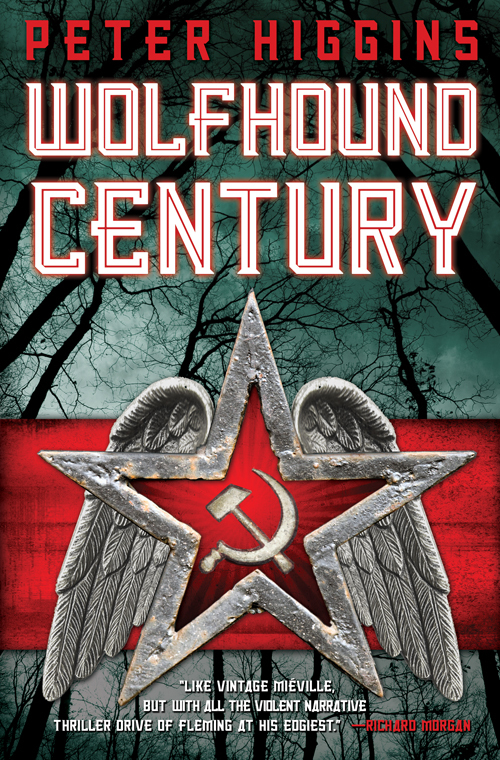 Wolfhound Century has been advertised as having a sequel (already written and submitted, thankfully), Truth and Fear, due out in a year's time, so it was already known that this would probably not be a completely self-contained book. The problem is that at no point is it stated that Wolfhound Century is functionally incomplete as a novel. It doesn't so much climax as just stop. This isn't the first in a series, but the first chunk of a much longer single novel being published in multiple volumes. Some forewarning of this would have been appreciated. Also, given that Wolfhound Century is only 300 pages of pretty big type in length, the question arises of why this story is being published in such small chunks also arises. Still, whilst Wolfhound Century (****) may be just the first chunk of a bigger story, it is still a finely-written and compelling story. Higgins has created an engrossing fantasy world which is a million miles away from the more played-out ends of the genre and all the better for it. The book would have simply benefited from either being held back until the entire story was complete, or a mention of its heavily serialised nature was given on the cover at some point. The novel is available now in the UK and USA. Screwing up the ending by not having one is not cool. We don't know whether to lay this at the feet of the author or the publisher, though.